Heavy duty protection. Protect your knees against injuries often sustained in the most rigorous working conditions as a result of kneeling. 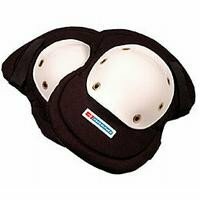 These lightweight pads have hard caps made of abrasion resistant plastic. The soft foam padding and adjustable straps ensure hours of comfortable productive work.